Kevin Garnett shows the world how to celebrate an NBA title. Kevin Garnett shows America how to celebrate an NBA title. As the clock expired on the Boston Celtics' merciless beating of Los Angeles Tuesday night, Kevin Garnett fell to his knees atop the leprechaun logo at center court. It was a touching tableau—you couldn't quite tell whether Garnett was genuflecting before the Celtic gods or had simply keeled over with exhaustion. Nobody in the NBA plays with Garnett's intensity, and nobody—perhaps in the history of professional sports—wanted to win a championship more than KG. We got our first hint of just how badly Garnett wanted it back in 2005. In an interview with former Georgetown coach John Thompson, the then-Timberwolves forward said that, on account of his team's middling season, he hadn't "slept right in about two months." At about the 4:20 mark, Thompson asks Garnett, "What's driving you?" His response: "That I'm losing. That I'm losing." A few seconds later: "I'm losing." After a sniffle and a shake of the head: "I'm losing." Garnett then puts up his index finger, asking the camera to stop rolling. "These are tears of pain," he tells Thompson. A minute later, he loses it again. "I hate that I'm like this in front of you right now, man," he says, sounding like a guy who can't keep it together during a wedding toast. Garnett has since left his losing ways behind and helped engineer the biggest turnaround in NBA history, turning the Celtics from a laughingstock to a champion. Tuesday night, it became clear that—just like losing did—winning has made Kevin Garnett completely insane. In perhaps the strangest postgame interview of the television era, an ecstatic KG talked, shouted, and raved for two and a half minutes in the general direction of ABC sideline reporter Michele Tafoya. 0:00: Greeted by Tafoya, Garnett first appears to be gripped by emotions familiar to any sports fan who's watched a championship celebration: happiness and disbelief. He presses his brand-new championship hat to his head with both hands, seemingly afraid it might come loose. 0:07: "NBA Champion—how does that sound?" Tafoya asks. Garnett is at a loss for words. After a long pause and more futzing with his new hat, he says, in a strangely even tone, "Man, I'm so, I'm so hype right now." 0:20: Garnett tells Tafoya that "anything's possible." He then leans back and howls at the moon: "ANYTHING'S POOOOOOSSIIIIIBLLLLLLE!" He holds the note for four seconds. 0:27: At this point the catharsis gets the better of Garnett, and he begins crying. 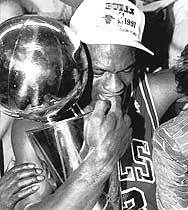 These are not the poignant tears of joy shed by Michael Jordan upon winning his first Larry O'Brien Trophy. Garnett is in the throes of something closer to a child's tantrum, mumbling indecipherable words. Approximate translation: "Oh my buh buh, fa fa fa fa fa." He then buries his head in the shoulder of an unidentified Celtics staffer, who proceeds to say, "Yeah, baby!" repeatedly. ABC's producers pull away for a moment, cutting to a long shot of the arena. 0:53: We're back on Garnett. "I'm sorry, Michele," he says, apologizing to Tafoya for having lost it there for a moment. "It's all right," she reassures him. The moment of composure is fleeting. 0:57: "This is for everybody in 'Sota!" he bellows, a classy shout-out to the fans who supported Garnett for the first 12 years of his career. Such is the reservoir of good feeling that Garnett has built up in Boston that no fan will begrudge the Twin Cities getting top-billing in Garnett's list of thank-yous. If Ray Allen had dedicated the Celtics win to the hardworking people of Seattle or Milwaukee, one wonders if it would have gone over quite as well. 0:58: Garnett thanks the city of Chicago, where he attended Farragut Career Academy. 1:06: Garnett thanks Peanut. As ABC noted in its pregame show, Garnett is very fond of peanut-butter-and-jelly sandwiches, but this Peanut would seem to be a person. When Tafoya caught up with Garnett after Boston defeated the Pistons in the Eastern Conference Finals, he closed out the exchange by saying, "What up, Brand? What up, Peanut?" Brand would seem to be Brandi, Garnett's wife. Might that make Peanut their newborn? 1:14: Garnett screams into the camera, "I made it ma! Top of the world! TOP OF THE WORLD!" That's exactly what James Cagney's maniacal, cackling gangster character says at the end of White Heat as he dies in a fiery explosion atop a gigantic gas tank. This explains a lot about KG's self-image. 1:20: Tafoya, who must be complimented on her poise throughout this exchange, parlays Garnett's screaming into a question: "What does 'top of the world' feel like, Kevin?" The query seems to momentarily ground Garnett, who again flirts with the normal rules of postgame interviewing, offering up some choice platitudes: "Ray Allen had a great game" and "I'm so happy right now—I'm not going to sleep for a week." Of course, since this is Kevin Garnett, the latter statement might not be hyperbole—he's previously claimed not to have slept for four or five nights during the Pistons series. 1:37: "I'm certified! I'm certified!" Garnett bellows. This may be the first time you could mistake a newly minted NBA champion for a raving lunatic on the subway. 1:40: In a more benign re-enactment of Joe Namath's propositioning of Suzy Kolber, Garnett says, "Michele, you look good tonight, girl." Over the course of the playoffs, the two have developed an easy rapport. After Game 1 of the Pistons series, he told Tafoya, "You look good in your pink, girl." 1:50: Tafoya asks Garnett what it means to win his championship in Celtic green. "It's a lot of responsibility that comes with putting this great jersey on," he says, paraphrasing that legendary Celtic, Spider-Man. 2:10: A parting word to the haters: "What are you going to say now? What can you say now?" Also, another parting word for the Cagney fans: "Made it, Ma!" The interview concludes, but the camera stays with Garnett as he turns to find Bill Russell waiting to greet him with a benevolent grin and a bear hug. In a conversation earlier this year, the 11-time champion told Boston's new star that he would give him one of his hard-earned rings if the team failed to take it home this year. KG almost cried. Now, even the stiffest upper lip in Boston has to be quivering as Garnett and his forebear embrace. "I got one of my own," says Garnett. "I got my own." He steps back, looks at Russell, and says "I hope we made you proud." A less weird individual might have left it at that, but Garnett has one more line for his mentor: "Now you got to tell me where to go tonight." Russell last won a championship for Boston in 1969. Unless the Celtics always celebrate their championships at the Warren Tavern (est. 1780), the old man's advice isn't going to be that useful. But this is at once a great statement of Garnett's respect for Celtic tradition and of how dedicated he's been to returning the franchise to its former glory—the man doesn't even know a good local bar for celebrating. Have a couple on us tonight, KG. You deserve it.